Do you ever neglect your planner because it seems like too much trouble? There are things you can do to make it easier to use. 1. Take it with you as much as possible. Keep it in your purse or bag or hand, but take it with you. If it isn’t with you, you can’t use it. If you don’t want to take it into stores or people’s homes, leave it in the car. You can always go get it if you need it. 2. Keep it near you when you’re home. I don’t mean you have to wear it around your neck, but keep it handy. When I work at my desk, my planner is on the desk next to me. When I go downstairs and cook or clean, I keep my planner on the table. As much as possible, I keep it near where I’m working. 3. Keep it OPEN. If it’s closed, you’re less likely to use it. Remember – we want to make it as easy as possible. The small step of having to open it might keep you from using it, especially if you’re in a hurry. So keep it open. 4. Keep it supplied with things you need. If you use post-its, keep them in the pockets of the planner. Always have a pen in the pen loop or at least nestled next to the pages (when I’m using mine a lot, I don’t always put the pen back in the pen loop). Make sure there’s blank paper and current inserts. 5. Keep it cleaned out. I don’t know about you, but I can’t stand using a planner that’s so full I can’t open the rings without papers falling out. That makes me NOT want to use it. If that doesn’t bother you, then don’t worry about it, but if it does, then keep it cleaned out so overflowing rings won’t keep you from using it. 6. Make sure you LIKE it! If you hate your binder or your pages are boring, you probably won’t use it. If your set-up isn’t working, you probably won’t use it either. So do what you can to make it work for you. 7. Look at it often. If you never look at it, you may as well not have it. Get in the habit of taking a look at it frequently. The more you look at it and realize how much it helps you, the more you’ll use it. 8. Have page finders or markers of some kind for the sections you use frequently. If it takes too much time to get to the section you need, you won’t do it. 9. Limit the amount of loose pages. If you open your planner and a bunch of stuff falls out, you’re not going to want to open it. 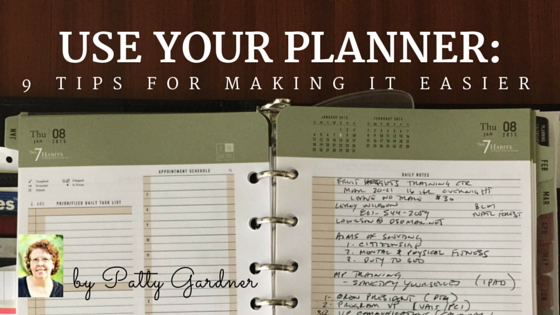 If you have a planner but don’t use it faithfully, why don’t you? If the hold-up isn’t any of these items, figure out what it is and try to fix it. A planner is an extremely valuable tool that can make the difference between chaos and calm. Sometimes you need a completely different system, but most of the time your current system just needs a tweak or two. Have you struggled with any of these issues? What keeps you from using your planner?